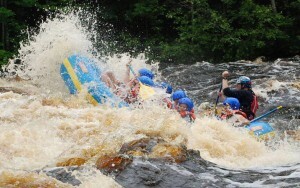 All rafters must be in good physical condition and unafraid of the water. Persons with any disabilities or medical restrictions, (such as Pregnancy, Obesity, Heart condition, etc.) 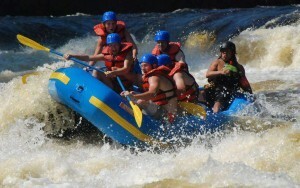 or have any limitations which would prohibit them from participating in a strenuous physical activity should not raft. Children should be 10 years of age and 90 lbs for the Peshtigo River and the Menominee River. In cases of changing water levels, age limits may be higher..
All Rafters must sign a raft rental agreement/release of liability form for each trip. 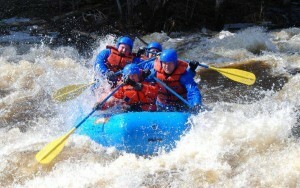 All rafters should be prepared for all weather conditions as well as all river conditions. 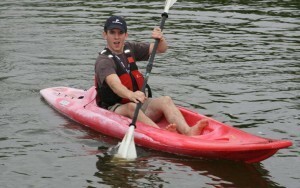 Peshtigo River rafters should be prepared to travel alone in a one person funyak if water conditions are low. Footwear is required on all trips. Shoes should be fastened securely to the foot and over the heel. No bare feet or loose fitting shoes will be allowed. An old pair of gym shoes are best. No containers of any kind will be allowed (coolers, cans, backpacks etc.) on the trips. 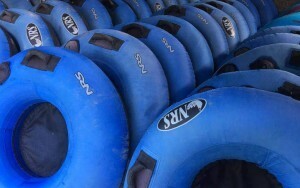 All safety equipment issued by Kosir’s Rapid Rafts for the trip must be worn at all times. No intoxicating liquor or illegal drugs will be allowed on the rafts, or consumed during trips. We reserve the right to have the final say in all matters pertaining to the trips and to amend policies at any time. We reserve the right to refuse service to any person we feel is unfit for the trip. All trips and rates subject to change without notice. Group leaders are responsible for providing all persons in their group with all information. Although we take every precaution to make our trips safe and enjoyable, there are elements of danger in white water rafting; thus you must travel at your own risk. Quiet Time is from 11:00pm to 7:00am. No music or loud voices between these times. All noise should be kept at a reasonable level at all times. Everyone is entitled to their privacy so please do not walk near your neighbor’s campsite. You must be 18 years or older to rent a site and the renter will be responsible for the site including any additional guests. All minors must be at their own site at quiet time. Please accompany children in rest rooms, bar and at the river. 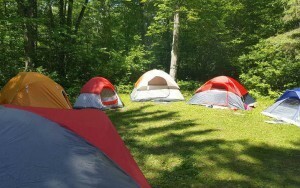 Minors camping without a parent must have at least 1 adult chaperon (24 years or older) in the group. Additional chaperons may be required for larger groups. SPEED LIMIT 5MPH! PLEASE WATCH FOR CHILDREN! No off road vehicles allowed in the Campground. That includes ATVs, Mopeds, Golf Carts, Dirt Bikes, Go Carts, Mud Trucks, or any other unnecessary traffic. ABSOLUTELY NO FIREWORKS OR FIREARMS or other projectile weapons of any type are permitted in the Campground at any time for everyone’s safety. PETS ARE WELCOME if they are properly restrained on a leash not longer than 8 feet, attended at all times, and under the control of the owner at all times. Dogs must be licensed and owners must be able to provide proof of shot records upon request. YOU MUST PICK UP AFTER YOUR PETS, and vicious or noisy pets are not permitted. There will be NO DUMPING of gray water or other wastes on the ground or in make shift septic systems or in open containers. All waste will have to be taken to the dump station. Dump Station may not be accessible at all times. ALL CAMPERS must keep their site clean and place garbage in the dumpster. ALCOHOLIC BEVERAGES may be consumed in moderation at your respective campsites, however rowdiness, profanity or excessive drinking or drugs will not be tolerated while at the campground or on the river. You must be 21 years of age to consume alcohol. FIREWOOD is available at the camp office along with other campground convenience items, and ice is available next door at the Rapids Resort. Firewood Can Not be brought into the campground unless it originates less than 25 miles from our campground. This is to prevent the spread of the Emerald Ash Borer and other invasive forest pests and diseases in our campground and surrounding area. We do allow customers to bring their own firewood from within 25 miles, however it may be no longer than 24″ in length. No saws, chain saws, or axes may be used in the campground. No person may climb, carve, cut, chop, trim, remove, or destroy any live, dead, or downed trees in the campground. NO WASHING of clothes, dishes, pets, or other items in rest rooms / bathhouse. These rules have been designed for the safety and comfort of all our campers, to ensure the enjoyment of your camping/rafting experience. This property is privately owned. The campground cannot be responsible for injury or damage due to wind, water, fire or the negligence of you or others. The camper accepts camping privileges with the understanding that he does hereby release the campground, its officers and employees of all liability for loss or damage to property and injury to his person arising out of his use of its camping facilities, and agrees to indemnify the campground, its officers and employees, against claims resulting from loss or damage to property or injury to the person of any member of the family or guest of the registered camper arising out of the use of its camping facilities. Please read and obey all rules and posted signs. They will be enforced. PARENTS, please make sure that your children aware of these rules. We reserve the right to evict anyone, WITHOUT REFUND, who creates a disturbance, nuisance, or endangers the safety of other campers or guests. Upon termination, the guest and their party shall be deemed trespassers.